Process is a fitting name for the debut CD by one-man band CEREBRAL NOIZE. Cale Burr slogged away on the creation of this CD over a five year period between 1997 and 2002. The CD is the culmination of a holistic approach to creating music and successfully delivers Burr's unifying vision of extreme metal. Burr literally had a hand in every aspect of the CD from writing the songs, to playing almost every instrument, to vocals, to the stellar album art and design. For a DIY package it is pretty slick; but all the work would be for not if the music couldn't stand on its own. Fortunately, it can. 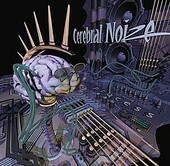 CEREBRAL NOIZE is a quirky mixture of razor-sharp thrash metal, industrial experimentation, and soul scorching death metal. A keen sense of melody underlies the entire work and helps to not only expand its accessibility but serve as a coalescing force that ties each song together. Let's hope that with this debut Burr has gotten enough momentum rolling that it won't take another five years to see a follow up.